Drive Medical is a leader in the manufacturing of durable home medical equipment. The goal of Drive Medical is to 'manufacture and market world class products which focus on innovation, functionality and value to improve the quality of life and to promote independence for the individuals that use our products. ADW Diabetes offers a full selection of Drive medical products. These products are aimed toward improving the quality of life of the people using them. 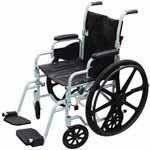 Drive offers products in the categories of mobility aids, bathroom safety, daily living aids, personal care, and more. In the area of mobility, Drive offers an extensive line of products such as wheelchairs, transport chairs, walkers, rollators, canes, and crutches. Each of these products has features that will benefit the user. From adjustable legs to hand brakes to cushioned grips, Drive has put a lot into the details of their products to ensure as much comfort and ease of use as possible. Drive Medical offers a large selection of products for use in the bathroom. From safety grab bars and benches to be used in the shower to elevated toilet seats, these tools are a great way to establish independence for people who enjoy their privacy. Drive also has created a full line of daily living aids that is geared towards making things a bit easier around the home. Tools such as grab bars, elongated shoe horns, reachers, and physical therapy products are available from Drive.